Such a fun character to draw. I mean, think about Indy but as a totally hot babe. How can that not be fun to draw?? Plus, just think about the name. It's such a fantastic name. It's one of those names that seems to have always existed. 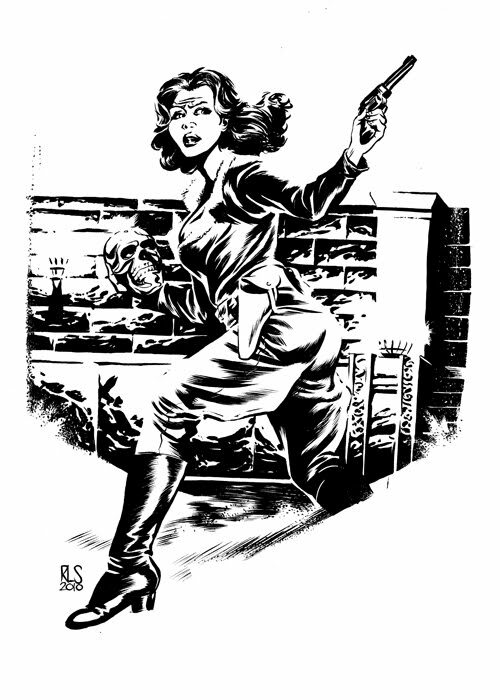 So, yeah, I like Athena Voltaire. I had originally designed AV wearing jodhpurs, but struggled with making them work consistently. You, on the other hand, didn't have trouble! Wow! Just a beautiful piece, man. Very cool Ron. I really like the composition of this piece. Steve - I don't know if I had no trouble. I just thought it was something fun to put her in. Besides, I just recently did a Pat Savage commission so I already had some practice. This is really fantastic, Ron! Excellent, Ron! Love the surprised but confident turn. Love the inks around the legs, Ron.